The GREAT 78 Project! | Brad's All Vinyl Finds! Digital. It’s great and it’s awful. This time, it’s great. It’s the Great 78 Project. And it’s just what it sounds like. 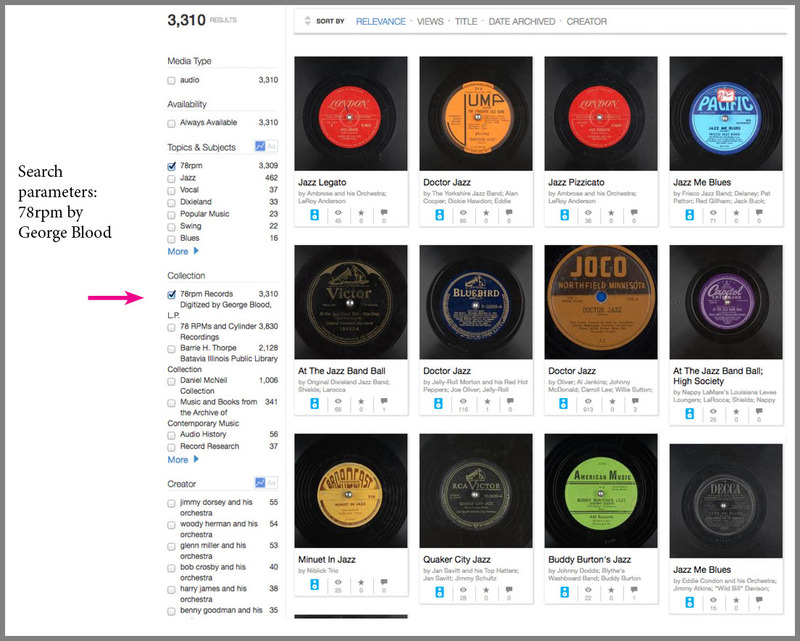 The Internet Archive (in San Francisco, California) is a partner in the quest to transfer 78rpm records for anyone to download for free. OK, my site is about vinyl, but at least these digital files start out that way. Plus a medium resolution jpg and a very high res TIFF photo of the 78 label and discography information. Sometimes there’s a review of the song. How about a 78 of Judy Garland singing Somewhere Over The Rainbow and a separate, early Maynard Ferguson (the jazz trumpeter) version, too? 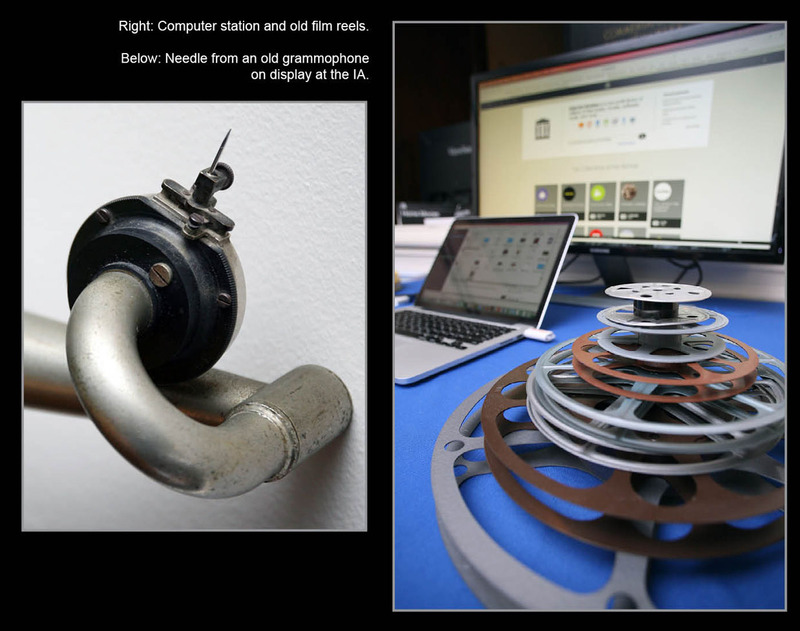 I did find that navigating the pages of 78rpm songs to be a little problematic. I’d click on a tune, download it, and after that, try to ‘go back’ to where I started, but was taken to a different page instead (of more 78s). Maybe it was my browser. To go direct to the Great 78 webpage description, click here. The Internet Archive just held an event (October 2017) where they talked about the Great 78 project. I’ve set the video below to start at 18:05 to hear Alexis Rossi talk about the project (see vid below). They’ve already digitized 35,000 sides. Rossi also details a great story about an Argentinian woman whose 78 collection from the 1930s was donated by her granddaughter to the archive. That collection was just posted online as the Tina Argumedo and Lucretia Hug collection and it’s 650 discs of tangos, boleros and more. If you’re into early South American music, this could be the mother lode. The IA isn’t just about vinyl. You will find old books, video games, paraphernalia, TV shows, movies…anything under the sun that can be digitized within copyright limits, they offer. You will spend hours, if not days, on their site. Check out a 3 minute medley of various 78 tunes, downloaded from the IA. Enjoy it! AND! 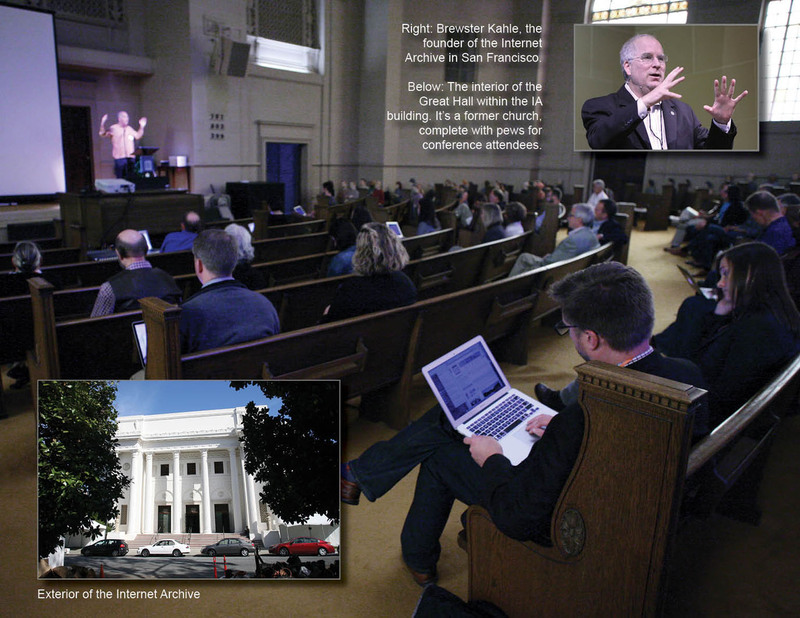 Below are a few more photos from an event held at the Internet Archive in 2015. Unlike most online sites that seem to exist only in the mist, the IA is a physical location and building, filled with a lot of very smart and dedicated people. They are pushing the envelope for getting materials online, working with major public libraries and Silicon Valley startups. Also below are a few links with more info about what the IA is up to. Example 1: Here’s a story by CBS about the IA putting 900 classic arcade games online. 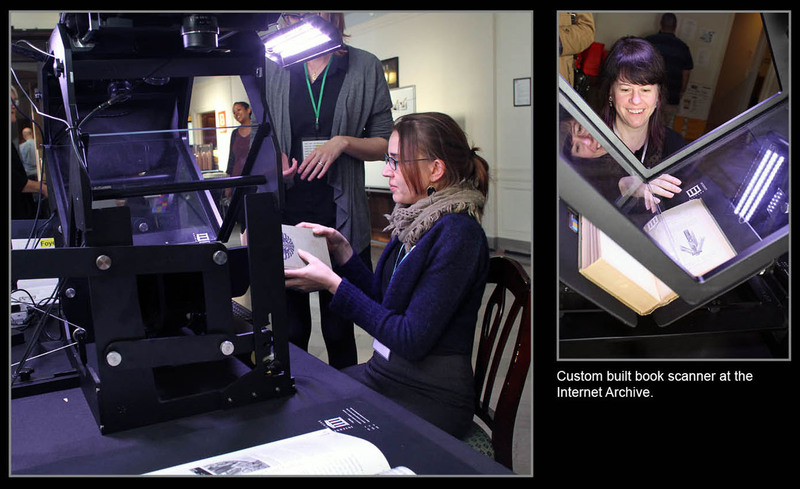 Example 2: The IA has been working on a project called the “Open Library” – The goal is to provide a page on the web for every book ever published. At its heart, Open Library is a catalog. The project began in November 2007 and has been inhaling catalog records from some of the biggest libraries in the world ever since. 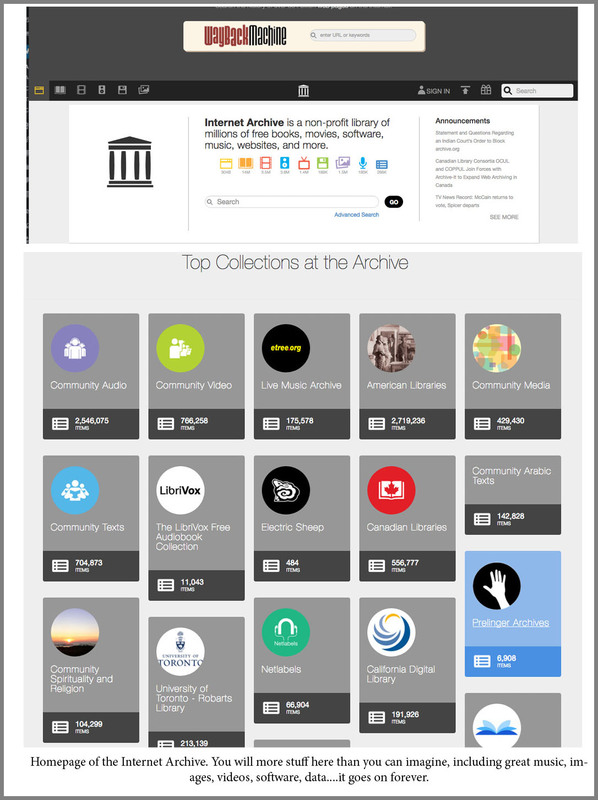 We have well over 20 million edition records online, provide access to 1.7 million scanned versions of books, and link to external sources like WorldCat and Amazon when we can. The secondary goal is to get you as close to the actual document you’re looking for as we can, whether that is a scanned version courtesy of the Internet Archive, or a link to Powell’s where you can purchase your own copy. Example 3: Free movies, TV shows, commercials, video game footage online through the IA.